I am in Premium Only Events: Supernatural, which is celebrating everything from demons to angels to ghosts and other supernatural creatures and events! The event runs from the 12th of October to the 2nd of November. I have two items for you to pick up. First I have the Divine Crown, a heavenly crown of magic and wisdom. It retails for $L150. The metal portions are in my standard 4 metals controlled by HUD and it is resizable via touch. 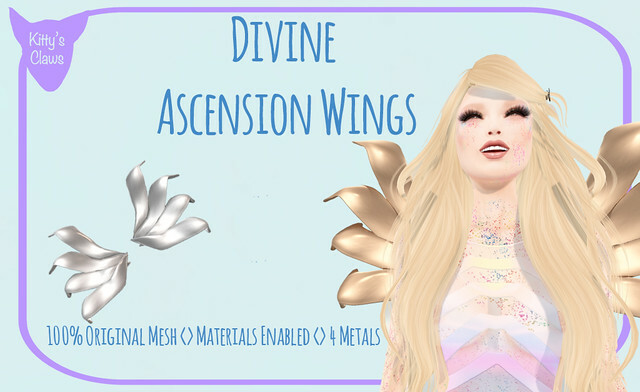 My other item is my Divine Ascension Wings, a more abstract version of angel’s wings. This one retails at $200. The wings come in my four standard metals, controlled by HUD, and like always it is resizable via touch. Just a quick reminder that the Deadly Kiss Bracelet will be gone from the Marketplace after the 31st. 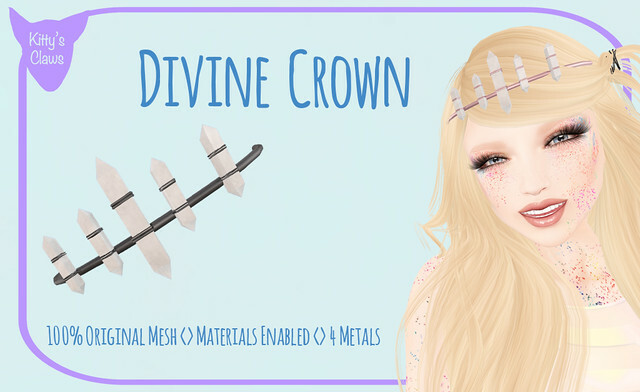 Also, the River Current Collar is currently being redone and will be on the Marketplace ASAP! I will see you very soon as the Geek’s and Nerds Event will be coming up shortly! Next: Next post: Kitty’s Claws at Geeks n’ Nerds!